Just One Damned Thing After Another is the first book in Jodi Taylor's Chronicles of St. Mary's book series. As such it has to confront the first hurdle that an introduction into a new universe suffers from - managing to get the audience onboard quickly and easily. To this end Max acts as out eyes and ears to the wonders that await us. As she discovers that time travel is not only real, but is being used by historians to actually observe and gather important details from various time periods, so do we. This helps to get over plenty of exposition without it feeling forced or unnecessary. 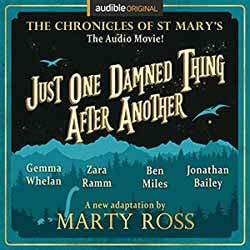 This audio production is adapted for audio by Marty Ross and stars Ben Miles (The Crown, V for Vendetta and Black Mirror), Gemma Whelan (SAG-nominated, Game Of Thrones, Gulliver’s Travels), Jonathan Bailey (Broadchurch, Leonardo, The Mercy) and Zara Ramm (narrator of the original Chronicles of St Mary's audiobooks). Graduate of the University of Thirsk, Madeleine Maxwell is recruited by St Mary’s Institute of Historical Research – a time travelling organisation whose remit is to ‘observe and document major historical events in contemporary time.’ Her first official jump is to 11th century London, to witness the beginnings of Westminster Abbey, quickly followed by a stint as a nurse in The Somme. After narrowly escaping being burned alive as her hospital goes up in flames, the possibility of sabotage rears its head for the first time. Is it possible that someone at the University is attempting to derail the experiment? And if so, for what end? While I haven't read any of the books, I found this audio drama to be incredibly engaging. The acting is believable and the audio effects never take you out of the action. In fact, once you've started listening, you'll find it hard to stop until the story is complete. Hopefully there will be enough interest to make it commercially viable to produce more audios based on the rest of the book series. If you're a fan of Taylor's stories then you'll love what Rosss has delivered here. And if you've never read one of Taylor's books this is the perfect way to get acquainted with them.